^This product is not intended to diagnose, treat, cure or prevent any disease. Several years ago, I was having frequent heartburn issues and had to take a prescription medicine daily to control it. After a few months, the reflux went away, and I stopped taking the medication. Recently, I started experiencing frequent heartburn again, and it was the kind that makes you feel like you constantly have something sitting in your throat and gets worse when you eat or even drink something. I have tried so many things to try and get relief, but nothing was working. I finally started taking Nexium® 24HR Acid Reducer Capsules and was able to get it under control. Nexium® 24HR Acid Reducer Capsules don’t provide immediate heartburn relief, but are a 14 day regimen and can take 1 to 4 days for full the effect. Just one Nexium® 24HR Acid Reducer Capsule a day gives you protection from frequent heartburn all day and all night long. 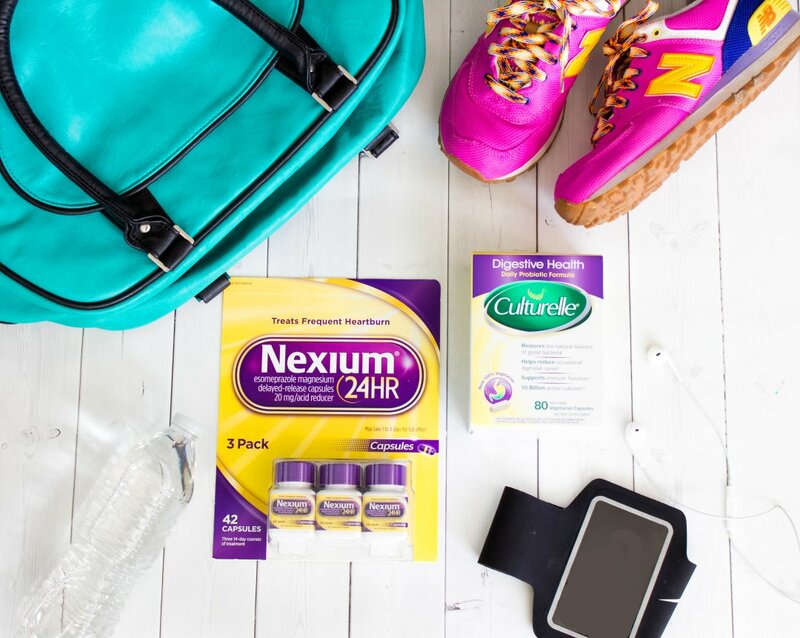 ** Nexium® 24HR Acid Reducer Capsules are the #1 choice of Doctors and Pharmacists for their own frequent heartburn. * Both of these items can be found at Sam’s Club, and if you look in the Sam’s Club Instant Savings Book, you can get $5 off each of these products! You can also get $5 off Benefiber® Prebiotic Fiber Supplement, for a total of $15 on all three. The offer runs from 8/23-9/17/17. **Use as directed. May take 1 to 4 days for full effect. *Among PCP’s and Pharmacists who use a branded OTC PPI. The third way that I like to keep my gut looking good (from the outside) is by exercising. I have found that regular exercise along with taking a probiotic really helps keep me feeling good all around. Running, walking and yoga seem to be the best exercises for helping with my digestive issues, so I try to do them as often as I am able. I also try to do a lot of exercises that that will strengthen my core and help me achieve some six pack abs again like I had before I was pregnant. Below I am sharing my favorite ab exercises for strengthening your core muscles. I usually do ab workouts twice a week and pick two of the exercises to do at each session. As I have mentioned before, I only do three sets of 15 reps per exercise to achieve my desired results. Ready to maximize your digestive health? Hover over the photo to click through to Sam’s Club to purchase them online! Planks- I know that planks are a pretty basic isometric exercise, but planks can help strengthen your entire body, including your abs, your lower back and your shoulders. Check out these 47 Crazy-Fun Plank Variations for a Killer Core! Abdominal crunches while you reach through your legs and keep your legs elevated – this is great for working the top portion of your abdominal muscles. Oblique twists – I always try to do some sort of exercise that will target my obliques and bicycle crunches or oblique twists with a medicine ball are basic moves that I like to use. V-sits – I start by laying flat with my arms overhead and then sit up into a “V” Shaped position with my legs elevated straight up. I try to sit in this position for 60 seconds, then I lay down flat and quickly move back into this position about ten times. Basic crunches – I like to do basic crunches with my legs elevated, knees bent or legs flat and will sometimes do them on a stability ball for an extra burn! Reverse crunches or the “Captains Chair” are my two favorite exercises for working your lower abdominal muscles. The “Captains Chair” is where you sit on a chair or bench and extend your legs in and out. I hope you all remember to take care of yourselves (especially your gut!) this summer and as always, thanks for stopping by! Thanks for sharing this! I’m starting to use probiotics and def will look into this one! What a fun workout #ootd! Those leggings are so fun! So many good tips! And love those leggings! Thanks for sharing these! I definitely need to give them a try! Hello AMAZING BODY!!! I need to go work out like right now 🙂 And I’ll have to try these products because I’ve been getting upset tummy pains after I eat sometimes! Thanks for sharing! I should give these a try! I should try these! Love your leggings! Probiotics are definitely a must! We definitely feel so much better with them. Will have to check out this new kind!